When we moved in here in 2006, the first thing that caught my eye was the Bougainvillea Hedge. I looked through the front window, to the backyard. It was blocked by a wall of magenta colored flowers against the windows. I took in my breath, walked through the house, then out back. Confronted by the reality of living in Florida, and the giant wall of flowering hedges that were here, I realized I was sold. There was a hedge on the west side of the property. Pure white flowers from one end of it to the other that were perfuming the yard with a sweet fragrance that was wafting on the warm breezes. Night Blooming Jasmine, I was told. They never grew fast. Every six months I would go out and hack the thing back. I would also take note that the plant wasn't growing back as well as I expected it to. Neighbors have either Podocarpus or Ficus hedges that were impervious. Complete block of any view corridor through those. They were shaped into unnatural, but pleasing, rectangles with sharp corners. Over the years, the hedge has thinned. There are gaps. I think we're overwatering it. It gets it twice a week, as is legal, on the irrigation system. 7AM I believe. It also gets a little bit more at 7:45 when the drip feed comes on to water the pots. The orchids love it. Skip one day and you can get away with it. Skip two and you lose all your flowers. That happened this year when I forgot and left it on Manual Water. The whole system is computer controlled so we don't drain the water table and run the well dry. But if you leave it on Manual, it won't go back on until you test or reset it. You do have to test these things. The drip feed bubblers are fed by neoprene rubber tubes that are quite small. About as thick as a piece of elbow macaroni, they clog frequently and you end up having to "blow out the lines" two or three times a week. Just don't forget to put it back on Automatic. So we'll be reprogramming the two separate zones back a little bit. Hopefully the orchids will forgive us. 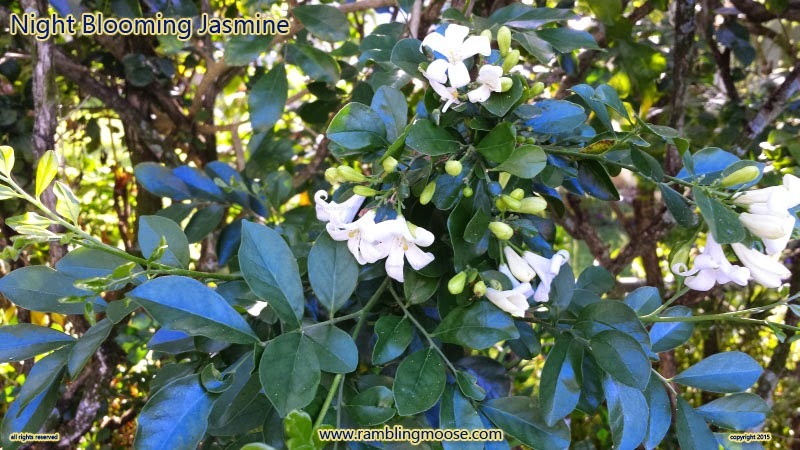 More importantly I'm hoping the Jasmine comes back. Between the leak we had on the city water line that was in the back corner of the hedge that dumped a couple car payments worth of water into the roots at a slow leak, and the two zones, that hedge is almost gone back in that corner. The palm tree that marks the end of the yard must have grown until it pinched the pipe back there, and Charlie at the City called us to warn us that we've sprung a leak. Thankfully we don't go back that far too often. While I can propagate the Podocarpus in a pot on the chain that I purposely keep most of the drain holes plugged to help it root, I haven't found a way to propagate the Jasmine. That's a shame, it's a beautiful hedge. Or at least it was.